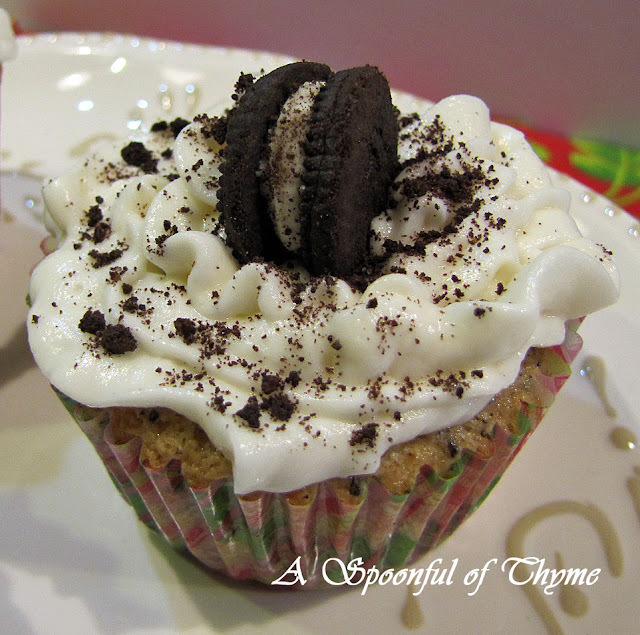 If you are a fan of Cookies and Cream Ice Cream you know that taking the two best ingredients, cookies and cream, and using them to create a cupcake is going to be fabulous. With the first taste, I was ready to sing from the highest mountain...so that "WOW!" would echo across the valley. I kid you not, these were wonderful! When I first saw the recipe at Brenda's Canadian Kitchen, I knew that I was going to be making them. If you have never visited Brenda's blog, it is a must. She is a wonderful cook and always has something exciting to share. Preheat the oven to 350? F. Line the wells of two cupcake pans with 24 paper liners. In a medium bowl, combine the flour, baking powder and salt; stir together with a fork to blend and set aside. In the bowl of an electric mixer, combine the butter and sugar and beat together on medium-high speed until light and fluffy, about 2 minutes. Blend in the egg whites one at a time, beating well after each addition. Blend in the vanilla extract. With the mixer on low speed, beat in half of the dry ingredients just until incorporated. Add the half and half and beat just until combined, then mix in the remaining dry ingredients. 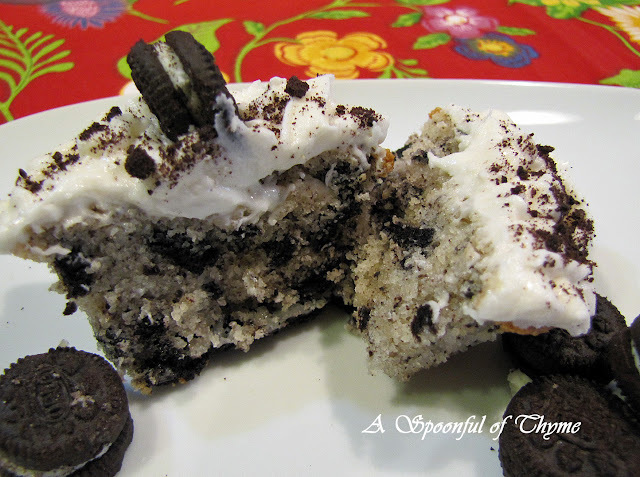 Gently fold in the coarsely chopped Oreos until evenly incorporated, be careful not to over-mix. 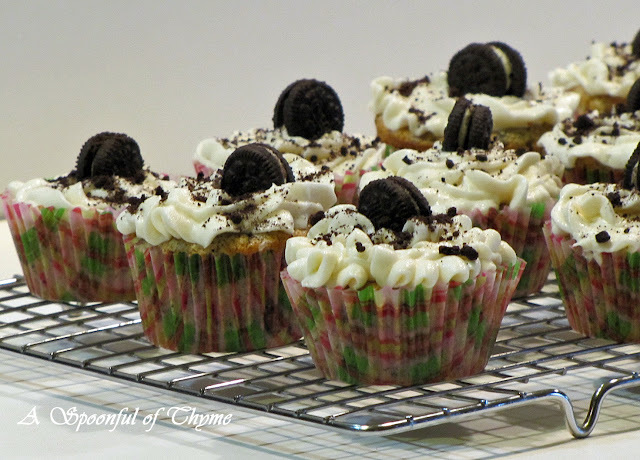 Frost the cooled cupcakes as desired. 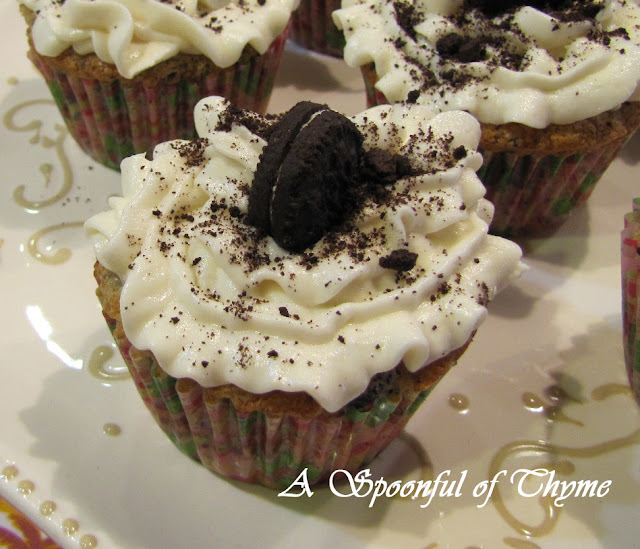 Sprinkle with Oreo crumbs and garnish with mini Oreos. These are wonderful cupcakes....very rich. I kept four cupcakes and sent twenty with the Kitchen Gnome to an evening activity. It would be way too dangerous to keep them all at home! It is much better to share with others! I am participating in Foodie Friday hosted by Michael at Designs by Gollum, Fat Camp Friday hosted by Miranda at Mangoes and Chutney, and Sweet Tooth Friday hosted by Allison.